are depicted on this British £5 coin. 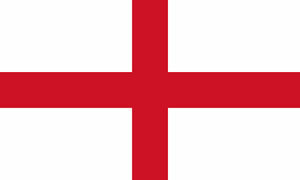 St. George's Cross became the flag of England in the Middle Ages. In the land of Cappadocia, which lies in today’s East Turkey, George was born to noble Christian parents. He grew up to be a fine and mighty soldier in the Roman Army but eventually started to travel, spreading the word of God. Now in the town of Silene, Libya, the citizens were having a terrible time. A dragon, fierce and mean, had emerged from nearby swamps and was attacking the land. This fire-breathing monster had green scales, mighty wings, and a huge, powerful tail. Its claws were fearful, sharp as daggers, deadly and dangerous. The beast breathed smoke and fire and scorched the ground. So poisonous was its breath, it killed all that were near it. Eventually, the dragon found itself at the village’s source of water, a pristine spring (although some say it was a sparkling fountain) that had provided the villagers with fresh pure water for their crops, livestock and families. This terrible creature took a liking the spring and the farmers of the area started to sacrifice two sheep a day to the dragon in hopes to keep it appeased. In exchange, the dragon allowed the villagers access to the water. Sadly, the day came when there were no more sheep, but still the dragon demanded a sacrifice and so it was decreed by the King of Silene that a child would be sacrificed each day. The sacrifice was both to please the dragon and also as a hopeful measure that someone or something would come along and destroy the fiery beast. And so, each day a child was chosen by lot and the child was sacrificed to the mean and mighty dragon. Then one day, who should be chosen by lot but the King’s very own daughter, the beautiful Princess Sabra. Despite his protestations and laminations, he knew that he had no choice but to make the sacrifice. Sadly, he dressed her in her finest silks and left her down by the dragon’s lair. On that very day, George came by and found the princess weeping and wailing. “Pray, tell me why do you weep?” asked George. Between sobs and wails, the beautiful Princess Sabra explained the plight of the villagers. “Go your way, good knight, for you cannot save me!” she wept. Suddenly, at that very moment, the ferocious beast appeared and charged towards them. Its nostrils spewed smoke and flames and it roared and gnashed its teeth. Quick as a flash, George drew Ascalon, his mighty sword! 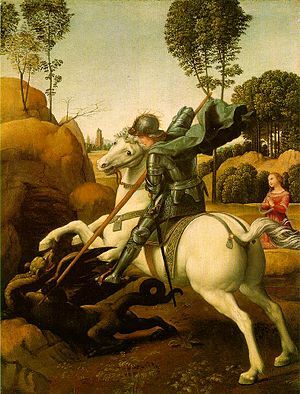 Resisting the powerful stench and the dragon’s mesmerizing eyes which glowed and dazzled, George was able to summon up his greatest strength. He made the sign of the cross and drew even more strength from his faith. And then with all the strength and power he'd mustered, he charged valiantly forward and slew the fearsome monster by plunging the mighty (and some say magical) Ascalon into the space between the dragon’s bewitching eyes! So thankful were the Princess and the King and all the villagers that they sang the praises of George. However, he humbly reminded them that his strength came from God and with that everyone converted to Christianity.